Association of Indonesian Publishers (IKAPI) held an international book exhibition called “Indonesia International Book Fair (IIBF)”. 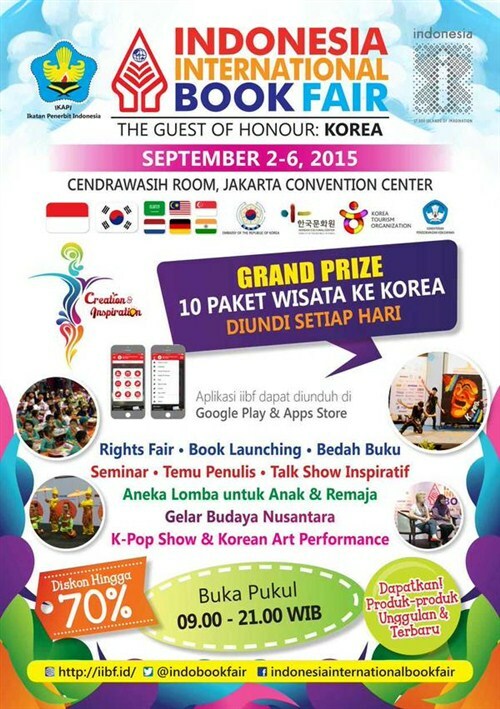 This event would be held at Cendrawasih Room Jakarta Convention Center on September 2 to 6, 2015. IIBF which has become an annual event of the bibliophile and this event will be a more complete, more affordable, more interesting, and more creative. IIBF 2015 prepared to be a one stop literacy activity, which is the center of comprehensive promotional activities to promote books and copyrights, writer, arts, culture, education, tourism and the creative industries. The participants of IIBF 2015 made up of publishers from the country and abroad, cultural institutions, the National Library as well as libraries of local and government agencies, distributors / bookstores, digital book publishers digital, electronic bookstore, and service providers of supporting education.